No matter how you got here….welcome. If I can do anything to help you get a better streaming experience, let me know! 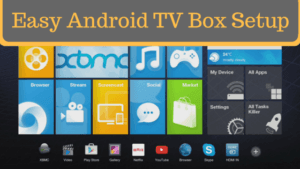 I’d like to offer a definition of what an Android TV box is: An Android TV box is simply a streaming media device running the Android operating system. It’s the same operating system that’s running on your smartphone, tablet and millions of other devices throughout the world. If you know how to use your tablet or smartphone, you can usually run most (if not all) of those apps on an Android TV box. Streaming media players like the Fire TV, Roku and Apple TV are great. They’re extremely easy to use, but rather limited in what they can do. An Android TV box can run almost any app because it has access to the entire Google Play Store and Amazon App Store. See if your Roku can do that. I go into those and other topics in more detail in this beginner’s article. It’s important to realize what a TV box is not: It’s not about you getting content for free that you would otherwise have to pay for. I don’t care what side of the piracy debate you’re on. Some readers are morally opposed to it. Others don’t think it’s a big deal. I’ll leave it up to you to decide. I’ll be here to guide you how to use your TV box no matter which of those two camps you fall into. Either way, I’ll show you how to get the most out of it. You are going to need a couple of things to get started streaming. Some you may already have. Some are free. Others may cost a little bit of money, depending on which ones you choose. Of course you’ll need a TV to get started streaming, but will your current TV work? Will you need to upgrade? Probably, unless your TV is more than ten years old. TV’s started coming with HDMI ports way back in 2006. Since you can’t get 4K content without the right TV connections, you’re going to need at least one HDMI port on your TV. If you don’t have an HDMI port, but still want to cut the cable cord and start streaming, there are other options for you. Just know that you won’t get the best picture quality using a different cable. What if all of your HDMI ports are filled by other things, like your Blu-Ray player or game console? You can add what’s called an HDMI-splitter or HMDI switch in between your TV box and TV. I assume that if you’ve gotten this far you’ve already made your choice between a Smart TV, a mainstream streaming media player and an Android TV box. If you skipped the first part, first of all…why? Secondly, skip back on up to the first section and read over the differences. 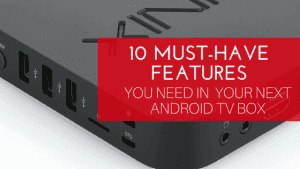 Android TV boxes aren’t for everyone and you should be reasonably sure that’s what you want. Still here? Great! Let’s move on. When I say “the right TV box”, what I mean is the TV box that does what you need it to do, offers you a little room to grow, but without loading you down with extra bells and whistles that you don’t need or will never use. The right box lets you stream what you want, when you want it. For example, if you’re an Amazon Prime Video subscriber, the right box for you probably isn’t an Apple TV. Likewise, if you’ve got your content in iTunes and you’re happy with it there, you probably don’t want to be looking at an Android TV box. Does that make sense? I test out a lot of TV boxes. In fact, at this very moment, my shelves are full of review samples and test units. Some of them are great. Some are worthless junk. If they’re junk, you’ll hear about it from me. Many of the other review sites will try to spin everything to be an amazing “must-have” device, and that’s complete BS. You won’t get that from me because I think you’re smarter than that. I believe that I’m here to be your guide and your trusted friend. Which TV boxes do I recommend? I’m glad you asked. Its one of the most popular questions I get from my readers. So I’ve created an article which has my recommendations for which TV boxes you should be looking at right now. If you’re shopping for a new device, it’s a great place to start. If you’ve already picked out or even bought your first TV box, then you might be wondering what else you need to make it work. 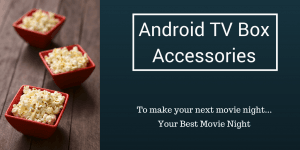 I’ve created two detailed guides to help with that: Android TV Box Accessories will give you a good overview of some of my favorite accessories that I’ve used in the past few years. 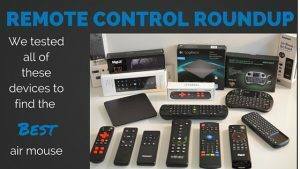 I’ve also created a huge guide all about air-mouse remote controls. The Android OS was designed for touch screens, so there are some challenges adapting it to remote controls. Plus, it can be a pain in the neck to clean the fingerprints off your TV all the time. 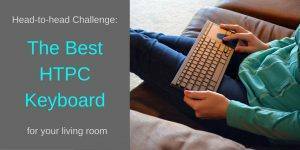 If you want a bit more control, then maybe you’re looking for the best HTPC keyboard for your living room setup. 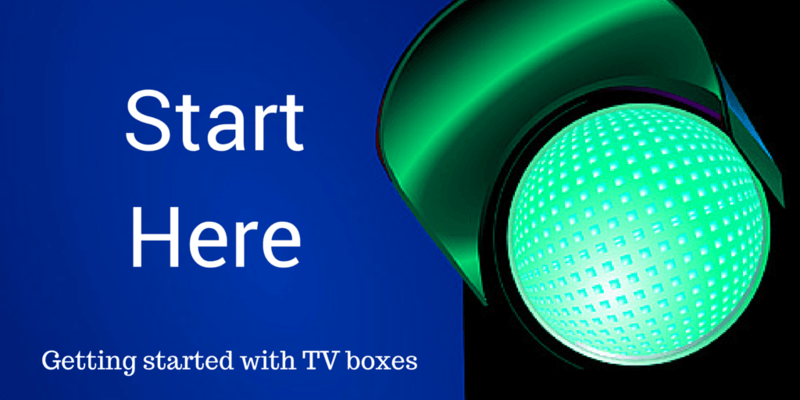 Now that you’ve got the right TV box…now what? It’s time to get it set up the right way. 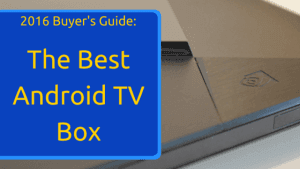 If you’ve just opened the box and are hooking up your brand new TV box now, I’ve created this short article to walk you through how to set up an Android TV box. It’s a checklist of things that you can skim over to make sure you didn’t miss anything important. If your TV box is already set up, then that means thinking about how you’re going to play your media. 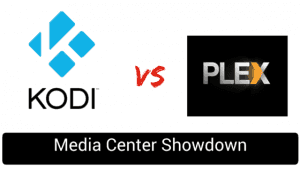 The two most popular media centers are Kodi and Plex. Each is an amazing program with a ton of great features. Each has their own devoted followers that will say that theirs is the best. But, one may be the better choice for you. Here I’ve highlighted some of the main differences between Kodi and Plex, which will help you decide which is right for you. If you’ve set your heart on Kodi, then you’re in luck. The hardest part about Kodi is sifting through all of the junk information out there. You’ve already seen it. 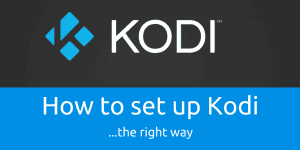 “How to install _____ addon for Kodi.” It’s hard to find something that will take you on a detailed, step-by-step journey installing Kodi, setting up your media libraries, changing the skin, installing official addons, and more. All of the essential parts of getting it setup correctly. There was nothing out there like that for beginners, so I made my own Kodi tutorial. I also highly recommend setting up a VPN for your streaming device. Personally, I use a VPN, not just to be more secure when I’m streaming content, but to get access to more content around the world than I could otherwise. How do I do that? Take a look at why I think you should use a VPN and also why you should use a VPN for Kodi. …with the right streaming service. Everyone needs at least one streaming service. Without one, you’re limited to playing your own content or streaming from sources that are either unreliable illegal or both. Personally, I have a couple of premium streaming services that I use year-round. One that I get for a few months for a temporary binge watch when Winter Is Coming, and one other service whenever it’s hockey season. Your needs are probably different. 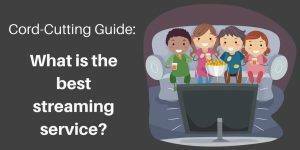 What you’ll need to do is to pick the best streaming service for you so that you don’t miss out on the shows that you want to watch. These services cost money, yes. But you can still save money overall, even when paying for a streaming service, or three. The cost of what my streaming services (described above) for an entire year is less than I used to pay the cable company for two months worth of their TV service. I’m saving hundreds of dollars a year, and getting everything that I was watching before. Just think what you can do with that extra 10 months worth of money. Normally, finding a guide who can help you on a journey can be tough. This time, it’s the easiest part of your journey. I’d love to share my knowledge and experiences about TV boxes, streaming media players and the different media center options that you’ve got in front of you. The content in my email list is exclusive. You won’t find it anywhere else. Get the tips, how-to's and product reviews that you need to have the best streaming experience...delivered right to your inbox! Great reviews! Thanks a bunch! I have read your information on streamsmart. Like others cable has gotten ridiculous and I am looking for a device that I can get my ACC basketball game and that’s it.. I have a friend who did Stream smart praises. I’ve learned if it’s too good to be true it usually is. I’m so glad that I read your review and looked at this page. I haven’t made my mind up. I have a TV in the bedroom and I’m confused about it. I have Chromecast and I started Hulu last month. Thanks again. And any advice is welcome. Thank you very much. I am a total novice, so this is wonderful as able to read & u.derstand as you have written it on a level that those of us who have no idea can at least understand majority of it. Also where to buy TV boxes blank I can find preloaded do not want as they overload with lots of add ons. Hi Eve. Your welcome and thank you for the kind words. To be honest, I prefer (and recommend) everyone to buy basic TV boxes, without any addons. First, you know the TV box manufacturer puts a bit more into the hardware since they don’t have the marketing scam of “get free TV for life” that the “fully-loaded” sellers do. More importantly, you get full control of what’s on your TV box. You only have the addons and apps that you use, not all the bloatware that you don’t need and will never use. If you scroll up a bit, there’s a link to my “Best TV box” recommendations list. You can’t go wrong with the stuff on that list. Let us know which one you pick! Hey Tim: I’ve used your site many times. It’s a great resource and I’m thankful that you’ve decided to create it. I am new to Media Streamer. I do have a question for you. that you didn’t mentioned them. Second question. What is your 1st choice on Media Streamer and why? Any advice would be appreciated. Hi Paul. We spoke about this via email, but I wanted to share my thoughts for everyone else reading. In my opinion, they are more interested in turning a profit by overcharging for their media players than they are in selling a quality product. If you see someone selling an ATVB Media Streamer run far. Run fast. There was a booth for ATVB at the Fair, selling their boxes for $200. They claim that you receive all channels and subscription services for free (Netflix, Hulu, HBO, etc). Seems too good to be true, and I’m assuming they are pirating all of this content somehow? Any thoughts? Definitely pirated content. If someone is advertising free channels that you normally have to pay for, they’re pirating that content from somewhere. I’m not going to judge, but you should know what you’re signing up for before you buy it. My main problem with that is that the main benefit that they’re selling you isn’t something they can control. If they’re betting on something to pirate that Netflix or HBO feed, and that site goes dark, then you’ve just got an expensive paperweight. Is there a difference in performance between the shield 16 gig and the 500 gb? The only difference in the two Shield models is the price and the size of the hard drive. I was wondering though, would it be possible to have a roundup/rating of the best Android TV boxes for armchair gaming? Obsiously the Shield TV is going to be at the top of the list for the foreseeable future, but from there downwards (i.e. mid-range to budget, even an under $100, then under $50 scale) the options are really difficult to decipher for us beginners, and the various generations of ARM/Mali naming conventions make it almost impossible to figure out where each one fits on the high/low performance scale. Maybe even have a current ‘top 3’ gold/silver/bronze type podium for your favourite boxes at any given time in the high/mid/budget ranges, that you update whenever new boxes get reviewed, so visitors can see the current top picks? Sorry, I’m just getting back into the media player buzz after a long hiatus and I’m full of ideas buzzing around my head! I’m a total newbie. So much so that i only just learnt that there are such things as Android tv boxes. I stumbled upon here trying to learn more about them and i must appreciate the complete guide you’ve put down here, from a-z. Its perfect! I just posted it on my fb labelled: everything i need to know! Thanks! I want to ask, (wondering if you will comment) what about a chinese no brand gadget, if it has the specs? I don’t live in the US and I’m looking at them. I do realize about quality issues but i have experience of chinese gadgets and they may be a risk but if they do work, they are good. Hi Dennis. You’re welcome. I’m glad I could help! As far as getting live football, it depends on how you want to go. Depending on what’s legal in your country, or how comfortable you are with illegal streaming, there are plenty of add-ons to Kodi that will let you get live sports. I would strongly caution you about that though. Unofficial Kodi addons have been known to cause security issues and may put your system at risk. Personally, I always stick to official addons and streaming services, even if I have to pay for them. The peace of mind is more important to me than saving a few bucks a month. which is better for my needs a minix neo u1 or a preloaded matricom g box q.i’ve owned a skystream. does the minix take alot of knowledge to load? Hi Rick. I will always say it’s better to get a bare-bones box like a MINIX and customize it however you like, rather than buy a fully loaded TV box. Setting up Kodi is a little more involved, but you’ll end with a TV box that is configured exactly how you use it, rather than some generic “one size fits all” device that isn’t really for you. Hi Mr. Tim Wells ! It’s great to have some fresh air on-line about Android TV boxes, etc. ! Your site is so up to date, easy to understand in terms that anyone can get ” SOMETHING ” out of what is being stated ! I’m really looking forward to see what I can learn about all of the in’s & out’s .I do have a question for you , if you had to choose between the MATRICOM G-BOX Q2, RVEAL RTVBX1, & NVIDIA SHIELD 4K HDR STREAMING MEDIA PLAYER ,which one would you choose & why ? Any other boxes would you recommend would be greatly appreciated ! Please advise asap & keep up the great work . B.C. Hi B.C. My go-to box is my NVIDIA Shield. It may cost more than many of the other TV boxes, but it is well worth it. It is one of the few that can go Netflix and YouTube in 4K. It can run Plex Media Server without any crazy configurations. And it’s running Android 6.0, which is rare for TV boxes. My other box that I use is my MINIX NEO U1. MINIX makes really high-quality boxes that are regularly updated with new firmware. One box that I’m interested to try out is the new SkyStream One. The company is local to me here in Orlando, and they’re a great bunch of guys. Let me know what you choose! is android TV Box support Touch screen ?? Hi Krish. Android TV boxes run the same version of Android as your smartphone or tablet, so they would still support touch screens. What VPN would you recommend? I do not wish to download or go to torrent sites. Just want the privacy and protection. Hi Earl. I’m just starting to look at all of the VPN options, but you can check out my Android VPN article here. Thank you for your useful contents, really appreciated. newly I have bought a KIII android box (it is S905 Amlogic). I am wondering if I can replace android with linux for more control on device. Hi Hassan. You should be able to flash the device and put a Linux distro on it. That’s not something I’ve done, though, so I’m not sure where to send you for help. Thanks for such a wealth of information. One question which do you prefer, Quad Core or Octa Core ? Hi Joe. Good question. I’m very skeptical of most of the marketing hype around multi-core devices – being an old computer builder and all around geek. It’s better on the mobile side of things, compared to the desktop side, but most applications do a bad job of fully utilizing all of the cores. To give you an over-simplified explanation, the app has to be written in such a way that it can use different cores to process information at the same time. Not all of them are, so much of the benefit of multiple cores is wasted. 1) They actually use less power. Because of the design, they are (usually) configured as two separate quad-core boxes in one unit. Four cores are performance cores, and the other four are efficiency cores. If you’re running something power hungry, then the four performance cores kick in for the majority of the workload. If you’re just casually surfing the net, then the main cores go dormant and the efficiency cores kick in to save on power and extend the life of the unit. Pretty cool stuff. 2) All things being equal (and they never are), the octa-core units are some of the newer devices. With technology, it’s a fine line between buying too much (and never using it to the fullest potential) and too little (and outgrowing it quickly). If an octa-core is the same price, or only slightly more expensive than a quad core from the same manufacturer, go with the octa-core. First of all thanks, great site to learn. I am researching a bit before buying my first box. I find the section “Android TV vs Smart TV” confusing. You say that Android TV (the OS) runs only on TVs, and that all boxes run the generic version of Android. That’s not right. 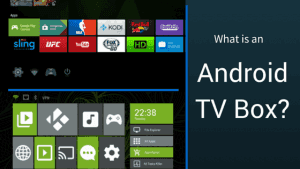 As I understand it, the NVidia Shield and the Nexus player and the new Mi box, they all run Android TV. And this is exactly what I want to decide…if I should buy the new Mi box (Android TV) or the Neo U1 you recommend. So I think the way you put it is a bit confusing… I would say “Android TV” box versus generic Android box. Good basic overview, so thanks, it helps to be educated on this exploding industry where almost monthly a new model is introduced with faster processor, more memory, better WiFi with dual antennas, never mind pre-programmed which I have found is one of the most important factors since most are not techies. Turnkey is the secret, and most will pay a little more to have a totally plug and play media center. As to paying monthly fees, or per movie fees, this too is a thing of the past, buy the right system once, and there are no monthly fees, unless you want to finance media center. For past two years I have saved over $2000., not counting what I had been spending for pay per view movies. Free is always better than pay to play, so the future of streaming is bright, for those who can see. FREE-PPV or get paid to watch what you want when you want, no DVD needed, it doesn’t get anymore simple than this. Hi Shimmy. Thanks for the kind words and the comment. I appreciate it. I haven’t heard of Kolof before, but looking at their box and the specs, it looks to be another one of the generic, rebranded TV boxes that are so common today. I’d recomend sticking with something like a Beelink which makes the same device, but has a better history. This article helped me solve 3 problems AND make them, make sense lol You are so right…. It’s so hard to find clear and concise advice. Looking for info usually ends in an hour of sifting through worthless videos, only to end up aggravated and I give up! You have a way with words and are freakin hilarious…. I love it! I have an android device called ATN3000II.2002, running Android 4.2.2. To be honest with you I don’t like the look of it. I am just wondering if it is possible to upgraded to at least 5.0, 5.1 or even 6.0. I really appreciate it if someone can provide any help regarding the firmware and how to install it. Hi Milo. Any upgrade of the Android OS would come straight from the manufacturer of the box. That’s more involved than a simple firmware upgrade. I am new to the Android TV Box Market and I have been doing as much research as I can on these boxes. I am having a tough time deciding on what box to go with given all the information available and the two sides of user perspective. I read a bunch of the articles on here and I am deciding between technical specs, price, preinstalled or clean slate and reviews. After reading articles on here I am between the NVIDIA Shield, Matricom G Box Q2 and MINIX NEO. I am steering away from the NVIDIA and MINIX due to the slightly higher price. I also found on the fully loaded side of the boxes the Skystream One, Leelbox T95Z and I was advised by a friend the XBMC Mart Fully Unlocked box. Out of those given the specs the Leelbox seems like the best deal, lower price and better specs, the only downside I found was no HD on Netflix. Any thoughts or guides to sway away from the Leelbox that I am unaware of? I haven’t found many complaints o the Matricom G Box, just unsure if it is better to install Kodi myself or just uninstall some of the extra Kodi software the Leelbox comes with. I can’t find many reviews on Leelbox negative or positive which makes me a little unsure about it. Any input is much appreciated and welcomed! I am looking to get my first android tv box with the purpose of streaming media from my synology server thats connected on my home network and i was wondering what android tv box you would recommend for that? Price dosnt matter really just want the best for my application. Hi again Tim, you are an amazing man with a wealth on knowledge to offer. My only hope is that the people really appreciate you and what you are doing. Many thanks. Thank you for the kind words Donald! I appreciate it. Thanks a lot for the work you have done in writting this and the rest of the recommendations. I have to be honest with you. I am thinking of having an Android TV box not because I want to save money from the cable companies but because I am sick and tired of not being able to watch what I would like to watch, just because either for the cable companies it is not good bussiness to provide what I would like to watch or because they want to avoid competition from someone that can provide what I would like to watch. And I want to rebel against that. I live in Canada and as you may know I am not allowed to suscribe to services like DIRECTV or any other provider in the US. I am not particularly impressed either about the sort of TV content they provide (US providers) but they do give one the chance, even if limited, to watch soccer games live from certain leagues which I am interested in (particularly South America and Spain). I am a big soccer fan and this is what I am looking for: to be able to watch as much soccer as I like and from where I want. BeinSports provide some coverage in Canada but they charge you an arm and a leg for a suscrption (20 cnd. dollars per month), and on top of that you have to pay a ridiculous amount of dollars for the cable company that includes their package. One has to paid almost 40 dollars for the basic package, which includes rubbish and/or channels that one can watch over the air. You gave a good review of the MyGica ATV1900 Pro. I am wondering if I would be able to achieve my stated goal with this device. There is a cheaper version: ATV 495 PRO, and I would like to ask you if I can get what I am looking for with it. The other question is about VPN. I have already VPN, but my concern is if I use VPN to connect the box to internet if it will not hurt the performance because in general the speed in the servers they have are much less faster (usually ~2-5Mb/s) than my own IP (mine is 60 Mb/s). I “rented” a box from a guy (a crook) and without VPN I can watch things without having any problem with Geo filtering. For instance I was able to watch RAI TV programs, which I know are restriced to viewers in Italian territory. Hi Tim.. Have you looked at the Time Machine box, It’s being marketed for $450 in our area. I can’t find much on it online but it looks very similar to many of the other boxes. Are these guys just scammers? Great article. I never considered the necessity of a VPN until I read this. Now that I’m a bit more informed on the hardware side the hard questions start. Content? Cost for content? Am I really going to save money or am I just cutting my cable bill to pay someone else? Most importantly, am I going to Frankenstein together a box that my wife won’t be able to use? When buying an android box I would advise to always buy amlogic over RockChip. I tested boxes for 3 companies for about 3 years and RockChip sets up its storage strange. You may think you are getting a box with 16g of storage then when you try to add a couple apps you will get a message saying you are running low in storage. They have a small .92 or .98 set aside for adding apps then the other is all NAND storage. And they will have bloatware that typically takes all you space to add apps. When kodi and spmc were running well they were good for that. You could add a huge build and have between 800mb and 1500mb of extra space for kodi to cache to so it worked well in that sense but every RockChip box I tested bricked or went into a boot loop eventually and they will not release firware to be able to flash it to fix it. I have two nice 16g octocore RC boxes sitting here bricked and I have the firmware I just haven’t had the time to flash them due to a severe car accident that I’m thankful to be alive but i can use my phone and my illogic t.v. boxes but don’t have the range of motion or time to flash them so that will be a project for when I heal in about another year. But I can say I have some great amlogic S912 octocore CPU with the newest Mali gpu. These boxes run great. Amlogic boxes I generally have 20 to 30 apks and use to have kodi or more preferably spmc set up as well. I run my cable or directv right thru the boxes with apps from the app store, my wife insisted on keeping basic cable and stars which to me is nice but a waste. Anytjing I can watch on cable I can watch on the box thru apps along with any movie. I wait until movies are hd before watching but it doesn’t take long and sometimes will be on the apps before it hits theaters. So if looking for a good box look for a box that has firmware updates like minix or similar. Right now amlogic S912 is the latest greatest but its been out for several months so something new should be coming soon. You can find some boxes for $50 with 8g storage which is plenty your not going to load 8g worth of things on them. If recommend that if you want to use facebook on a box get a cheap box for facebook only because it will take up all your storage. Stick to Amlogic and you should be fine. I like Amazon because they have a 30day return policy on all boxes and really you can return it because you don’t like it. You can do that from you account settings and they will instantly email you a shipping label so its free to send back. They day they will add the money you spent to your Amazon account but they have added it to mine as soon as tracking showed it moving and it was very simple I bought the same box again because I had tested it and bought 10 or 15 for gifts but I’d stay away from all the fully loaded cheap which most of them just say that but I wouldn’t buy from eBay either. And if you box stops working after the 30 days you have to return them, most box sellers offer a 1 year warranty in which they will fix or replace the box but I think you are responsible for shipping cost so I’d read the fine print I have a really nice Emish box that I really like that went I to a boot loop after the 30 days so I need to cobra t the seller and make arrangements to use the warranty before it expires. Thanks so much for all the info on this site. I have resisted “cutting the chord” until now and having said that I am close to clueless with the tv box game. It seems that if one wants to be able to view what they have had before with their cable and or satellite’s that the shield would certainly be a good deal. Great site and as close to easy reading as is possible for such an integrated subject. Thanks again ! if I buy an Android box for my main TV, how do I go about using it for the TV in my bedroom as well. Do I need an additional box for it. I’ve enjoyed your articles which I’ve been enjoying for some months now, however, just when I need some very frank advice they have tapered off. I hope all is well at your end because I really need some help/advice. I bought an S!M1 android tv box to use with my non smart (but excellent) LG tv. Howeever, I have a problem. I am an 80 year old “wrinkly” struggling to keep up with this fast changing technology. I am very hard of hearing and rely on subtitles to watch tv. I have looked online to try to find out how to get subtitles on showbox. I think the instructions are for ‘phones although I did say ANDROID TV BOX. Sorry for this lengthy, somewhat garbled plea for help, but HELP! Great post especially for a super newbie like me…I ordered (before reading your post) an android MECOOL M8S Pro W. What do you think of it? Another thing, my screen is a non-smart Samsung, but with an ethernet inlet.So how can I set IPTV subscription on it ? Thanks for all your help. Hi Tim, I’m really new on this Android TV Box thing. I have read your explanation on the right tv and it emlightenes me a lot. 1. I have been using a LG UHD 4K Smart Tv with web os. Is this an android tv? 2. I have terminated my IPTV subscription as the program was crap. I have been paying a lot of money for the 10Mbps fibre internet as well as the programming that keeps recycling. (5 yrs to be exact). So I am looking at Android TV Box for free streaming.